The Robertsons are ready to wrap up their reality TV show reign. The family has decided that Duck Dynasty will end its run after the current 11th season, leaving the A&E series effectively cancelled. Ducks everywhere are quacking a sigh of relief. A&E aired the family’s a video message, last night, after the Duck Dynasty season 11 premiere. The series stars Jase Robertson, Si Robertson, Willie Robertson, Kay Robertson, Korie Robertson and even more Robertsons. The Louisiana family owns the Duck Commander business which makes products like duck calls, for duck hunters. While the video isn’t available on A&E’s press site, you can watch it over at Deadline. 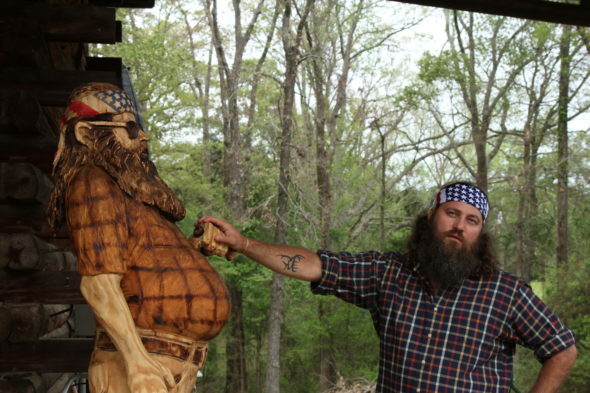 The Robertsons do say that after the series ends, they will return occasionally with Duck Dynasty specials. What do you think? Are you a Duck Dynasty fan? Is it ending at the right time, or should it run longer? Sound off in the comments. i would give anything for duck dynasty to come back on no i dont have anything to watch on tv. I Agree I Really Enjoyed Watching That Show I Wished They Would Have Stayed On Longer. I wish they would stay on, it seems they are taking shows that people enjoy and are putting garbage. What happened to enjoying a program, to much filthy programs are replacing family programs. I wish you would stay, I enjoy watching you all. It makes my husband and my day every Wednesday night. Especially when we see Si give you, ( Willie) a hard time. And the other two brothers give you a hard time as well,Willie. And you, Willie some how get even with them. Some families are like yours, Willie. Wish you consider staying. Duck Dynasty will be be truly missed. I love this show for it’s family and Christian values also love their humor. I wish they would reconsider. There’s not too many clean and wholesome shows on TV these days. I will be looking forward to the upcoming specials. We’ve come too far, and worked too hard to have such a racist, homophobic show on Arts & Entertainment Television!!!!!!! Good riddance Rednecks! I am saddened to learn of the show being cancelled. I enjoy the Robertson family. I thank them for teaching us about JESUS and the love a real family has for HIM and each other. GOD bless you all. What if they were teaching the goodness of Buddhism?? Would you feel the same way? We are all members of the “Human Race”, can we start acting like it now??? It’s almost 2017!!!!!! They’re canceling this crappy show. About time I can’t believe people’s IQ are that low to watch something like this.! How do you know what its about if you dont watch? About time. It was WAY TOO scripted after Season 3.